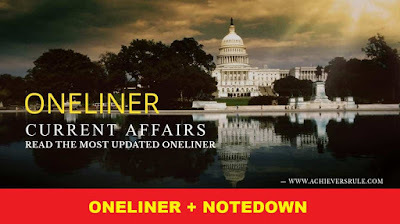 Achieversrule has brought to you the Latest and Updated set of news in a single line in our today's One Liner GK Current Affairs: 14th March 2018. These are short and concise news which are important for the upcoming government examinations of Bank, Rail and SSC. We hope our readers will find it useful and go through these thoroughly. Moreover we request our readers to practice the Daily Current Affairs Quiz daily for better performance in the examination. Nepal’s first woman President Bidya Devi Bhandari has been re-elected for a second term. A signed hardcover copy of Nobel laureate Rabindranath Tagore's 'The King of the Dark Chamber' has been auctioned for 700 USD. Saudi Arabia Cabinet Approves Nuclear Power Program National Policy of its atomic energy programme. Amazon.com Inc launched its first-ever debit card in Mexico, part of a push to encourage shoppers without bank accounts to buy online. The Indian Air Force (IAF) for first time flawlessly landed its largest transport US-manufactured aircraft, C-17 Globemaster at strategic Tuting Advanced Landing Ground (ALG) in Arunachal Pradesh, which is close to Chinese border. The International Air Transport Association (IATA) has signed Memorandum of Understanding (MoU) with Ministry of Civil Aviation (MoCA) and National Aviation University (NAU) to enhance human resource availability in India’s aviation industry. President Ram Nath Kovind inaugurates World Hindi Secretariat in Port Louis, Mauritius. Prime Minister Narendra Modi will address farmers at the annual Krishi Unnati Mela in New Delhi. Prime Minister Narendra Modi launched Tuberculosis (TB) Free India Campaign after he inaugurated Delhi End-TB Summit in New Delhi. India-United Kingdom (UK) Joint Team has won Newton-Bhabha Fund for project on Groundwater Arsenic Research in Ganga River Basin. The Indian Council of Medical Research (ICMR) was awarded 2017 Kochon Prize for building tradition of excellence in Tuberculosis (TB) research and development. World renowned physicist Stephen Hawking has died.